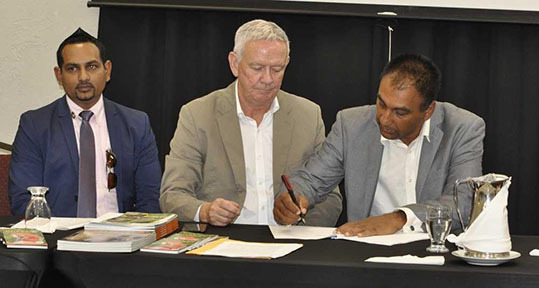 Guyana Tourism Authority head, Mitra Ramkumar (extreme left) looks on as Roddy Carr (center) and Aleem Hussain (right) sign the $20b deal. ”Norton says gov’t in the dark on $20b golf project.” The photograph published, was an old photograph which depicted Banks DIH Limited officials, who have in the past sponsored golf tournaments. 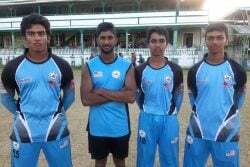 Stabroek Sports apologises to Banks DIH Limited and Citizens Bank Inc., and its officials, who are not in any way associated with the project or the story, for the error. Below is the correct photo and caption.